The consumption of omega fatty acides has received lots of attention and research due to their potential for numerous health benefits. These essential fatty acids, called omega 3’s and omega-6’s, are necessary for your body to function correctly and must be obtained through diet as your body cannot produce them. Omega-3’s can be obtained primarily from fatty fish, such as salmon, anchovies, tuna, and sardines. Plant-based sources include flaxseeds, soybeans, pumpkin seeds, walnuts, and tofu. Omega 6’s come mostly from plant-based oils, for example, those made from corn, soybeans, and sunflowers. 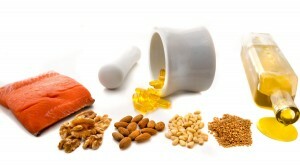 Most Americans obtain enough omega-6 fatty acids with a normal diet but may fall short on omega-3 consumption. It is best to obtain these nutrients by incorporating foods rich in essential fatty acids but supplements may be used effectively as well. The latest research findings with respect to omega fatty acids and dry eye have been largely beneficial. Numerous scientific studies have shown improvement in dry eye symptoms with consumption of these essential fatty acids. One such study, published in the journal Cornea, showed that over a 6-month time period, participants with dry eye who took a proprietary combination of omega fatty acids had reduced levels of ocular irritation, decreased inflammation, and improved corneal surface smoothness. Dr. Stephen C. Pflugfelder, a co-author of this study, noted that participants in the control group, who did not take the dietary supplement, experienced a worsening of symptoms during the study time frame. In another study from the November issue of Opthamology patients with dry eye who took omega-3 supplements demonstrated improvement of symptoms in just one month. The trial group had a 71% improvement in tear breakup time in comparison with only 3.3% in the group taking a placebo. Participant scores on the Ocular Surface Disease Index an indicator of symptom levels, decreased by 26% in the trial group yet increased 4% in the placebo group. Why are so many kids getting myopia?